Oh! the humanity. I am certain that the person who sent this has no clue about what he/she wrote. In addition, rocks of the younger Choptank and the St. Marys Formations are exposed. This makes Calvert Cliffs State Park highly interesting for paleoclimatology and paleontology, because the accessible strata provide a good record of the Middle Miocene Climate Transition and documents a minor mass extinction event, the Middle Miocene disruption. This formation is notable for the plentiful fossil shark teeth found therein. Especially popular among “rockhounds” are those from giants such as Carcharocles and the famous Megalodon (which is often included in Carcharocles). I’ve been to Calvert Cliffs State Park a couple of times, but the accessible areas there are quite small or over visited. So when we saw that the state parks system was hosting a kayak trip to find fossils, we jumped on it. As with most state park activities, it was a bargain! We shoved off from Bay Front park, just south of the city of Chesapeake Beach. The park has a very nice beach, but is so heavily visited that it isn’t a great place to hunt for fossils. We kayaked to a tiny ridge of a beach 2 miles south of bay front. Because all of the property here is private, the beach is inaccessible from land, (unless you live in the house overhead). However, all of the Chesapeake up to the high-water mark is public property, so landing on the beach is allowed. You just can’t go up the stairs which lead up the cliff! We brought shovels and small screens which we used to sift out the smaller particles, leaving (hopefully) only the items of interest – pebbles, fossil shells, and sometimes a shark tooth. Even without tools, if you search carefully, you can find teeth just by walking along the shoreline. The cliffs are clay-like sand that erodes easily and constantly into the bay. I bet the best time to come is after a storm or a heavy rain. Can you find the shark tooth in the picture below? When you’ve picked out all the good stuff, you can toss the pebbles on the sand. More images from this expedition are available here. It is a rather interesting topic, don’t you think? Imagine what it feels like! 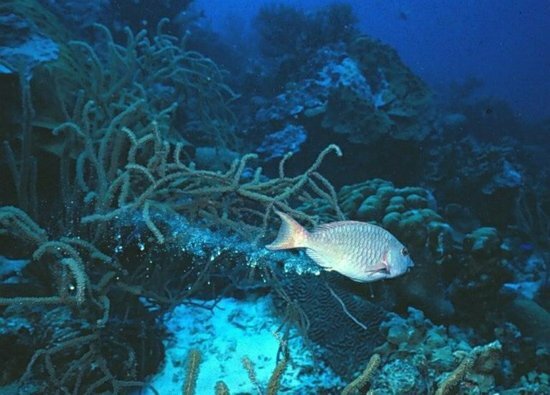 Parrotfish can really say that they eat rocks and fart sand. If they can talk. Which I doubt. But since the topic came up recently, here is a movie I took in Japan of a parrotfish eating algae that grows on coral. With every bite, it ingests some of the coral too. If you listen carefully, you can hear the crunching noises made when the animal grinds up the coral in its pharyngeal mill, which is a kind of heavy-duty gizzard. Folks, I present to you.. the one, the only SEACucumber. What kind of heartless fiend could do this to an animal? My outraged heart can barely support the knowledge of such brutality! But… how can such a thing happen? 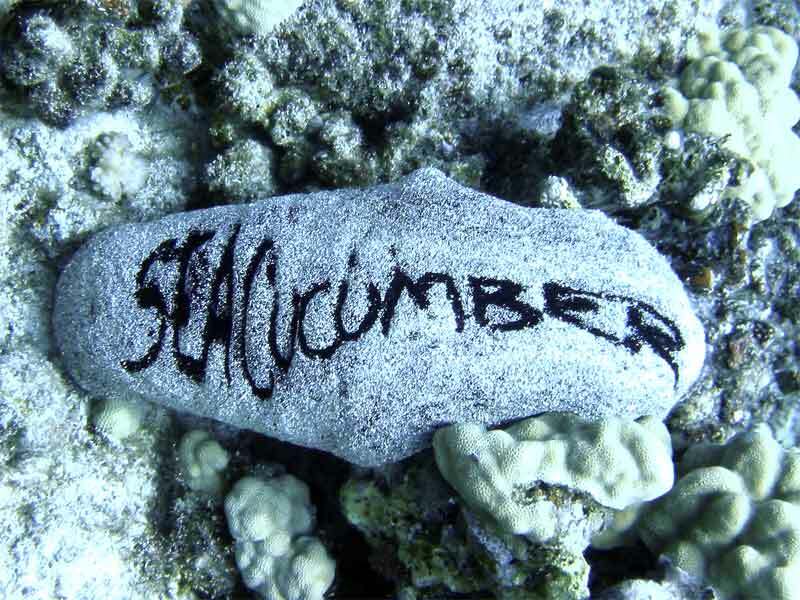 I mean, what is the skin of a sea cucumber like, that you could write on it? For those of you who have not had the pleasure of touching one, I’ll share my own experience. I have encountered a few varieties of this animal in places around the world. A lot of them feel… well, like cucumbers, with a semi-rigid polished surface. Others are distinctly turd-like, and cover themselves with mucous (hey – don’t judge – you do this with parts of your body too! I admit they’re on the inside for the most part though). The mucous of this animal has picked up a lot of sand, which is excellent camoflauge and also one more thing to make eating a sea cucmber less of a good idea. So some diver has picked this guy up and wiped off some of the mucous and sand with a finger. As the creature crawled across the ocean floor, the words became distorted as the animal stretched and compressed, like a slug crawling. I doubt that this caused any harm to the animal, although of course such an odd pattern would make it more obvious to predators (if there are any – probably something eats them). Here’s an essay I wrote as part of the National Aquarium in Baltimore‘s volunteer interview process. I’m working on being one of their volunteer divers, and if I get in, I’ll be scuba diving in the big exhibits regularly, speaking with visitors, and doing a lot of scut work. I figure that I should aim for an audience of sixth-graders escorted by adults. Let’s talk about fish turds. That’s right, piscine poop, A.K.A. fish feces. Exposition: At work, I am responsible for coordinating a small operation with the Navy. We need training to do this. We can’t go ahead until we get the training. I’ve spent several days determining that out of the 325,000 people in the Navy, there is a single LtCdr (Lieutenant Commander) authorized to take our money and start the training. Me: (On telephone, to the LtCdr) Hello, I’m a civvy contractor, and I have some people that need to get trained for the <blah blah> course. Where should I start? LtCdr: You have to start with me. I’m the only person who can do this. Me: Fantastic! I’m so happy to be speaking with you (Genuinely pleased). What is my first step? LtCdr: We can’t take any money. We are only allowed so much per year, and we’ve reached our limit. You can’t take any classes until October. Me: Wow. Ok, I understand (Crap, tripped up before the race even started!). But, if we wait that long, we won’t get trained in time. LtCdr: No problem. Call me on October 1 (Already moving to replace the telephone on the cradle). Me: Well, you see, I’ve checked and there are no classes in October. In other words, when there are classes, you won’t take my money, but when you will take my money, there are no classes. See my problem? Me: (Bewildered) So, Ugh… what can be done about that? LtCdr: (Dispassionate) Call me on Oct 1. Me: Hmm. Well… it will be too late by then. Me: I have to get this done. Perhaps there is an alternative way to deal with this. (I suggest several ways). LtCdr. (Realizing that I’m not about to give up easily, brings out the secret weapon) Is your budget OPN or multi-year R&D? LtCdr: (a direct hit!) It has to be one of those. Me: (Extremely polite) Yes, thank you. What is OPN? LtCdr: (Smug) It has to be OPN or Multi-year R&D. Me: Um… this is R&D activity, and we’ve been doing it for years. 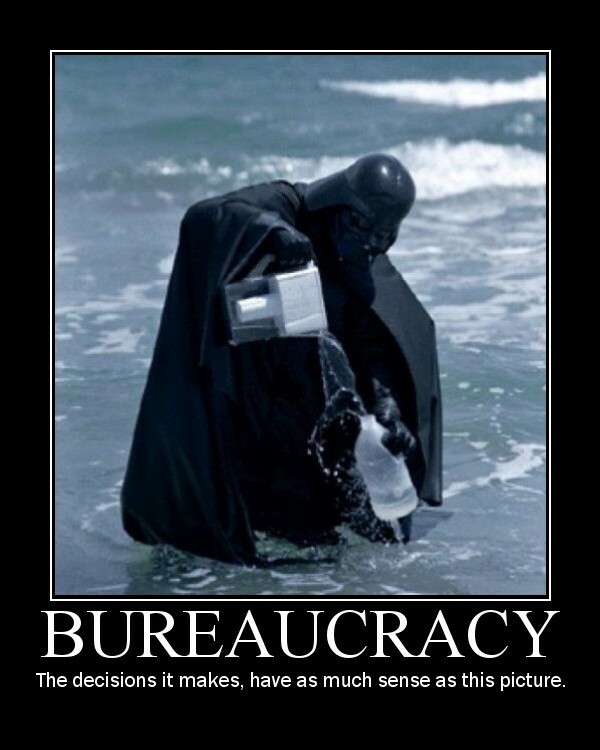 Do you need official verification? Me: I don’t know. Please explain, what is OPN? LtCdr: (Victoriously) It’s what it has to be for me to take it. Me: (Thinking that maybe this is a Turing test) Thanks. Does OPN stand for something? Is it an acronym? LtCdr: ( Let the circle be unbroken) It has to be OPN or multi-year R&D. Me: Well, here’s our Navy budget number. Does that make this clearer? Me: (Frustrated, still in control of myself) The Navy gave me that number… it’s the only number we’ve ever had to use… we are working for the Navy… you are in the navy… can you see if it is OPN or officially multi-year R&D? LtCdr: That number means nothing to me (and that’s not the only thing). Me: What is the definition of OPN? LtCdr: It’s what we’re allowed to take now. Me: How can I tell if my budget is OPN or multi-year? Me: Listen, I don’t know OPN from OBGYN. I didn’t decide to undertake this operation, nor did I write the contract. I have no idea what you’re talking about. Me: (Retreat!) I’ll call you back. So now I went and did some research, speaking with people who control budgets and have dealt with the navy for years. “Yes,” they said, “Of course it’s multi-year R&D, but we have no way of proving it, and we have no idea what OPN is.” Several days of precious time are thus consumed. Reluctantly, I phone the LtCdr. This also requires several days, as she’s often out, or the phone doesn’t get answered, regardless of the time, or sometimes another person answers and tells me that she’s on her afternoon run. Me: Hi, it’s me again. Me: Do you need some sort of official confirmation that this is a multi-year R&D OPN budget? Or can I just tell you? LtCdr: Is it OPN or Multi-year R&D? LtCdr: (a cat eventually tires of toying with its prey) OK, why didn’t you say so? I pretended that everything was normal; I couldn’t afford to mess it up – concentrate – use the force – complete the mission! Play like everything is normal. But she still has a chance. I won’t believe it’s OK until the guys are trained. I don’t know who made this. I’d like to give them credit. But whoever you are, thank you, thank you, thank you!